That’s what announced the trailer of the last Woody Allen film, Midnight in Paris, an ode to Paris. And I loved it! Oh, don’t worry, I didn’t fall in love with Owen Wilson, I don’t want to marry him! My heart broke once, it’s enough. No, with this ultimate opus, Woody makes a declaration of love to Paris, but he also makes a declaration of love… to love. Love is THE thing, he says. In art and in life. Forget the money, forget the mind, forget the « experts », the conventions. Art has to be familiar. It is not a question of intellect but a question of heart. We need to go into art as we fall in love, and that’s what is eternal and universal. So, of course : Paris! The city of Art, the city of Love. « Is there a symphony, a painting, a book in the world which can be compared with Paris as a work of art ? » Asks Woody, speeking with the voice of his caracter, Gil. Because the universe is empty and terrifying. Because we are all afraid about death. But, in Paris, people dance, drink, love! In Paris, the beauty is everywere. And that’s an answer to the mystery of our existence. That’s why we are all Mad About Paris ! And to personify the beauty of this city, of course, Woody chose Marion Cotillard whose adorable face in this film is enchanting. It was impossible for me to interview her (imagine, she wasn’t even at Cannes! She actually gave birth to her first son Marcel Canet last Thursday, just a few days before the Palmes d'Or was delivered). But I had an idea. 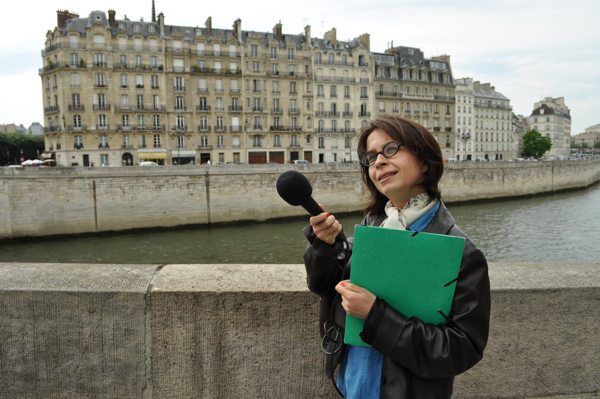 So, here is in exclusivity for you, my imaginary interview of: Paris !